Cerebral Cortex is the layer of gray matter in vertebrates that covers the cerebral hemispheres and is composed of folds of neurons and axons. It is responsible for higher functions of the nervous system, including voluntary muscle activity and learning, language, and memory. 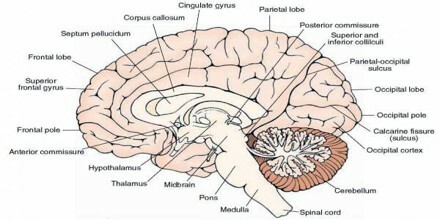 It is crumpled and folded, forming numerous convolutions (gyri) and crevices (sulci). The cerebral cortex plays a key role in memory, attention, perception, awareness, thought, language, and consciousness. Humans have around 25 billion neurons in the cerebral cortex, almost as many as elephants but substantially less than dolphins, pilot and killer whales. It is made up of six layers of nerve cells and the nerve pathways that connect them. The cerebral cortex is responsible for the processes of thought, perception and memory and serves as the seat of advanced motor function, social abilities, language, and problem solving. It is composed of gray matter, consisting mainly of cell bodies and capillaries. It contrasts with the underlying white matter, consisting mainly of the white myelinated sheaths of neuronal axons. The embryonic development of the cerebral cortex is under the control of a number of genes. In the first trimester of fetal life, neurons arise in a region lining the cerebral cavity. Precursor cells in this “proliferative zone” give rise to neurons that migrate up and out into the cortex, forming its layers. 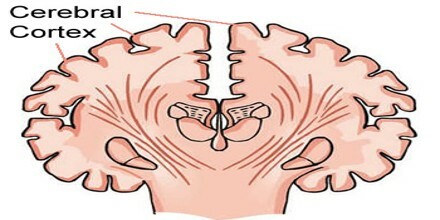 Cerebral cortex consists of folded bulges called gyri that create deep furrows or fissures called sulci. It is the thin layer of the brain that covers the outer portion (1.5mm to 5mm) of the cerebrum. 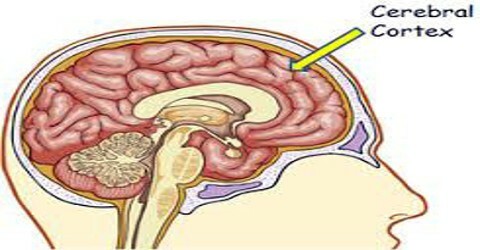 It is covered by the meninges and often referred to as gray matter. The cortex is gray because nerves in this area lack the insulation that makes most other parts of the brain appear to be white. The cortex also covers the cerebellum. Based on the differences in lamination the cerebral cortex can be classified into two parts, the large area of neocortex and the much smaller area of allocortex. There is a transitional area between the neocortex and the allocortex called the paralimbic cortex, where layers 2, 3 and 4 are merged. 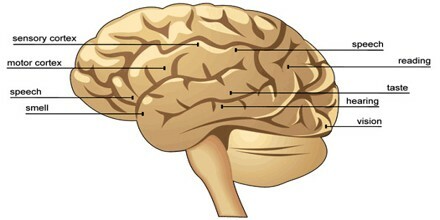 This area incorporates the proisocortex of the neocortex and the periallocortex of the allocortex. In addition, the cerebral cortex may be classified on the basis of gross topographical conventions into four lobes: the temporal lobe, the occipital lobe, the parietal lobe, and the frontal lobe. The cerebrum is the most highly developed part of the human brain and is responsible for thinking, perceiving, producing and understanding language. Most information processing occurs in the cerebral cortex. The cerebral cortex is divided into four lobes that each have a specific function. These lobes include the frontal lobes, parietal lobes, temporal lobes, and occipital lobes. It is folded in a way that allows a large surface area to fit within the confines of the skull. When unfolded, each cerebral hemisphere cortex has a total surface area of about 1.3 square feet (0.12 m2). They all include the visual cortex of the occipital lobe, auditory cortex of the temporal lobe, gustatory cortex and somatosensory cortex of the parietal lobe. Within the sensory areas are association areas which give meaning to sensations and associate sensations with specific stimuli. Motor areas, including the primary motor cortex and the premotor cortex, regulate voluntary movement. There are many neurodevelopmental abnormalities that can lead to a wide variety of behavioral and cognitive deficits. There are several situations in development in which both intrinsic and extrinsic factors can highly influence the course of nervous system formation.